Through the Department of Human Services in the State of Oregon, children with autism can access varying services, although, in the rural communities of Oregon, the delivery of those services becomes difficult. Rural availability is affected as members of the rural communities are less knowledgeable of the practices involved in administering effective services, instruction, and interventions to children with developmental disorders. The aim of this thesis is to identify areas within Umatilla County, Oregon where services and support systems are in place, or not in place. The population with whom this study was conducted includes individuals that have recent or past experience or relationships with children with autism living in Umatilla County, Oregon. The participants were asked to complete surveys consisting of questions relating to services they currently or in the past have provided to children with autism, questions relating to the delivery of those services, and questions relating to what type of support services they know of or have been involved in regarding children with autism or their family members. 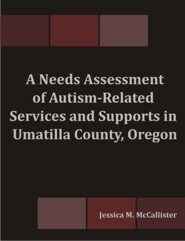 Data acquired addressed the already existing services and support systems and identify areas within the region where possible gaps or weaknesses exist, thus aiding in important knowledge and groundbreaking ideas into the need of autism-related services and supports in Umatilla County, Oregon. Jessica McCallister's interests include studying autism and developing a program which will serve children with autism and families of children with autism in her small community through meaningful, innovative ways. Her most recent accomplishments include being awarded the Dean’s Scholastic Achievement Award in 2010 from Walla Walla University, being awarded the Oregon Governor’s Volunteer Award in 2009 and writing a grant for the Department of Human Services Child Welfare division in Hermiston, Oregon in 2008. Mrs. McCallister is also committed to autism awareness and support by serving as a District Representative for the Autism Society of Oregon. As a personal pursuit, Mrs. McCallister writes articles for www.suite101.com on a regular basis including topics of depression, autism and college advice. Additionally, she is a book reviewer for the Journal of Families in Society.